This post is paid for by Kids Closet Connection, one of our most excellent community sponsors. This is the week to get your kids’ shopping done for pennies on the dollar! The Kids Closet Connection children’s consignment sale is back in Wichita this week, from March 6-9, 2019 at the Wichita Hoops Sports Complex. It’s a HUGE sale, always FREE TO SHOP, and one you will not want to miss. This year looks like it will be even bigger than last year! And… even better, I have a COUPON you can use to get an additional 10% off any purchase Thursday through Saturday. ALL you have to do is say “Wichita on the Cheap.” Yep! That’s it! Tell your friends, tell your enemies, lol. There’s still so much to find, although the earlier you go, of course, the better the selection. Saturday is the 1/2 price sale – when many of the consignors allow their things to be sold for half price. People often ask me if there’s a fee to shop at the sale – the answer is no! There is never a fee to shop the sale, and anyone can come! 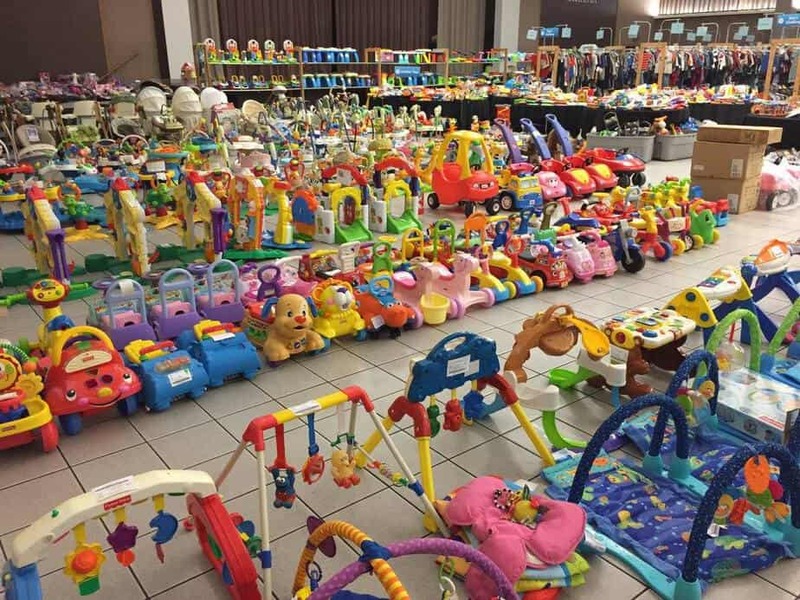 This will be a great opportunity to find great deals among rows and rows of lightly used kids and babies clothing, books, toys, sports equipment, maternity clothes, car seats, strollers, baby equipment such as swings, pack-n-plays, exersaucers, and more at up to 90% off retail. Plus, the Kids Closet Connection sale is FREE to shop – no admission fee at all. Kids Closet Connection consignment sale will be at the Wichita Hoops location again this year. How it works: People bring their gently-used kids items to sell, and volunteers organize everything on tables and clothing racks into categories just like a giant department store. You go through and find things you need. Everything is tagged, so you’ll see the prices of everything as you shop. They do accept credit cards. There is never an admission fee for this sale, so be sure to stop by and see what bargains you can pick up for your kids. Wednesday, March 6: 9 a.m.-7 p.m.
Thursday, March 7: 9 a.m.-7 p.m. The Kid’s Closet Connection children’s consignment sale from a prior year. Find out how to become a consignor here. This sale was voted Best Consignment Sale in Wichita! You’ll save a ton of money on great outfits, toys, and necessities for the kids at this huge and very popular kids consignment sale. Just go to Wichita Hoops any day during the sale’s open hours to see what they have. The last day of the sale is 1/2 price day, but of course the best selection will be on opening day. Whichever day you make it out, you’re likely to find something great. Jill and Bo Brown, the sale’s owners, ran their first Wichita sale years ago and were so successful they almost immediately outgrew their original location in a hotel ballroom. The new location at Wichita Hoops is perfect for all the great kids clothes and toys that consignors bring to the sale! Check out the Kid’s Closet Connection website for all the details. Also follow Kid’s Closet Connection Wichita on Facebook for contests, discounts, and the most up-to-date sale details.